Note: The Canon EOS-1D Mark IV has been replaced by the Canon EOS-1D X. The "D" means digital and the "1" means top-of-the-line, as-good-as-it-gets, #1. The "Mark IV" in the 1D product name indicates the maturity of this model - the fourth generation. 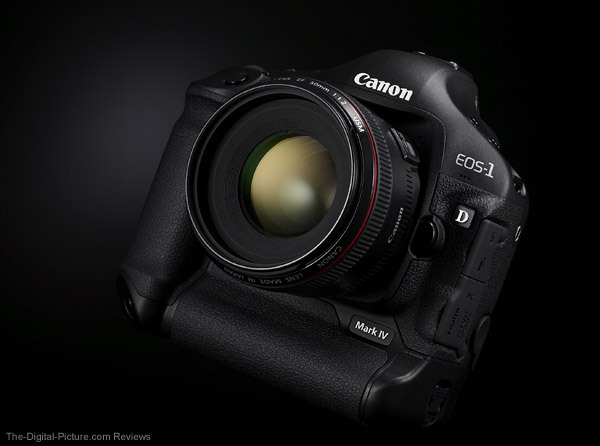 While the Canon EOS-1D Mark IV may not have every DSLR bell and whistle available at its release, it delivers a combination of speed, performance, image quality and durability unmatched by any other Canon EOS DSLR as of this review date. Who is this camera for? Though price will keep it out of reach of many, the 1D IV is an ideal tool for photographers in all disciplines, but it is the ultimate tool for photojournalists and sports/action photographers who absolutely cannot miss a shot. When you must (or want to) capture the shot, regardless of the shooting conditions and subject speed, this is the camera to do it with. 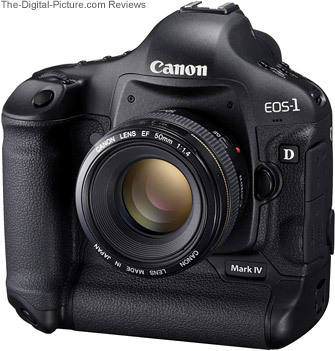 The 1D IV's predecessor, the Canon EOS-1D Mark III was geared to the same group. In light of some of the newer Canon EOS DSLRs (especially the Canon EOS 7D), the 1D III was showing signs of age - especially in sensor resolution. I have fielded a significant number of 7D vs. 1D III questions - and the decisions were not always easy. Now, with few exceptions, the 1D IV has the clear performance advantage over the 7D alternative. 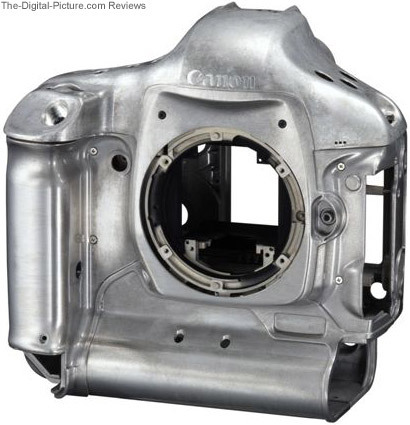 Obviously, Canon decided to retain the APS-H/1.3x sensor size for the 1D IV. Many of us were hoping for a full frame 1D this round, but this sensor performs very well. One nice aspect of this format is that the worst performing part of the full frame lens image circle, the corners, is avoided. To improve light-gathering efficiency, the 1D IV's new sensor features no gap between the microlenses and the distance from the microlenses to the photodiodes has been reduced. The 1D IV sensor utilizes the same self cleaning design as the 1D III, but now includes a fluorine coating on the top surface of the infrared-absorption glass to prevent dust adhesion. I'm pleased with the 1D IV's self-cleaning performance so far. Here are some primarily sensor-related specs for comparison. The 1D IV's very noticeable additional resolution over the 1D III can be seen using the mouseover feature in this Canon EOS-1D Mark IV vs. 1D Mark III resolution comparison using an ISO 12233 Chart. Test results from the EOS 7D (and many other Canon EOS DSLR models) are available for comparison at the same link. While the 7D retains a slight resolution advantage over the 1D IV, the 1D IV images processed to the same sharpness setting are sharper. I'm sure you noticed the "and probably still shouldn't" hint about image quality delivered at these mind boggling-high ISO values. The following examples will bring them down to earth. Below are a pair of 100% crop comparisons between the 1D IV, 1D III, 7D and 5D II. Click on the color block image below to view a pair of image quality comparisons between several current-at-this time DSLR cameras. This comparison was previously featured on this page, but has been moved to its own page to avoid (especially for mobile users) the large file download required. If you read the image quality discussion on that page, you can skip down to the emboldened "resolution increase". Differences in noise between the 1D III, 1D IV and 5D II samples up through ISO 6400 are minor and insignificant to my eyes - all 3 DSLRs produce impressive results. Thus, higher resolution wins at final output. The 1Ds IV maintains its good results while providing far more resolution than the 1D III without an increase in sensor size. 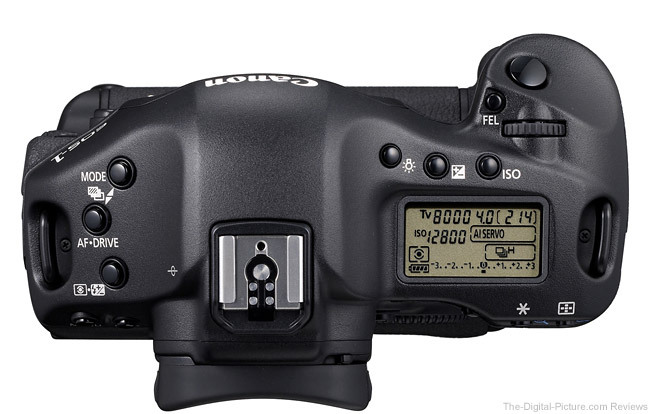 The 5D II has the sensor size advantage over the other two cameras. The 1D IV results are noticeably cleaner (and sharper) than the 7D results even at lower ISO settings. At ISO 12800 (a setting not available on the 1D III), we get into my avoid-if-possible range for the 1D IV. ISO 12800 noise is noticeable, but images are usable. The 1D IV results appear to be very slightly cleaner than the 5D II at this setting and at ISO 25600, even slightly cleaner. The 5D II retains the resolution advantage of course. 1D IV image detail is being affected significantly at ISO 25600. To be fair, Canon refers to ISO 25600, 51200 and 102400 as extended settings H1, H2 and H3. You will want to avoid them if possible, but images can still indeed be made at the High settings. Photographers without these settings available will be putting their cameras away while you continue shooting into the darker lighting conditions. The "w/ NR" noise reduction samples show that while noise in high ISO images can indeed be reduced, detail is sacrificed in the process. The in-camera-suggested noise reduction amounts are a good starting point and add a stop or so to the usable ISO setting depending on your taste and needs. I generally use a small amount of noise reduction in my high ISO images, but I typically lean toward saving detail over cleaner images. More resolution brings out more details in the fabric and, aside from the 7D results, the big difference between DSLRs I see in this comparison relates to the resolution of the compared cameras' sensors. More resolution shows more detail. The 7D's smaller (physical size) sensor has more megapixels than the 1D IV, but it delivers a less sharp image at an identical sharpness setting of "1" ("2" works better) and shows more noise than the larger sensor cameras it is being compared to. If, even after evaluating the differences, you cannot see a clear low-noise winner in these comparisons, the differences in noise are probably not going to be of significance to you in real world shooting. Same with resolution. And in this case, the Canon EOS-1D Mark IV shows a very nice resolution increase over the 1D III while retaining very good sharpness even at this low sharpness setting. A resolution increase is not always a good reason alone to buy the next version of the same DSLR model, but in my opinion, the 1D IV's resolution increase over the 1D III is upgrade justification enough. More resolution equals larger and better quality output (including prints) or more headroom for cropping. If you are using a 1D III or similar resolution camera now, the 1D IV allows you to frame your shot wider in the heat of the moment and crop later to get perfect framing - with potentially 1D III or more resolution remaining. Of course, increased resolution usually means a penalty to be paid in terms of file size. The following table shows comparative RAW file sizes for a photo of a standard in-studio setup with a moderately-high amount of detail taken with the referenced Canon EOS DSLR body. An image quality-related 1D IV improvement is the new white balance algorithm that attempts to make colors more accurate when shooting under low color temperature light sources such as household tungsten lamps. Until the 7D came along, Canon EOS DSLRs all evaluated auto white balance poorly under tungsten lights. Choosing the tungsten white balance setting or using a custom white balance was the easy solution to the problem. The EOS 7D gets tungsten white balance right. The 1D IV? Well, it Auto White Balances tungsten better, but images shot under these lights are still more warm-toned than they should be. The 7D definitely has the tungsten AWB advantage. Like many of its other features, the 1D IV's 63-zone metering unit is inherited directly from the 1D III. The metering sensor's zone correlation has been optimized for the Area AF frame's 45 AF points. Evaluative, Partial, Spot, and Center-weighted average metering are provided. Partial metering uses about 13.5% of the viewfinder area at the center. 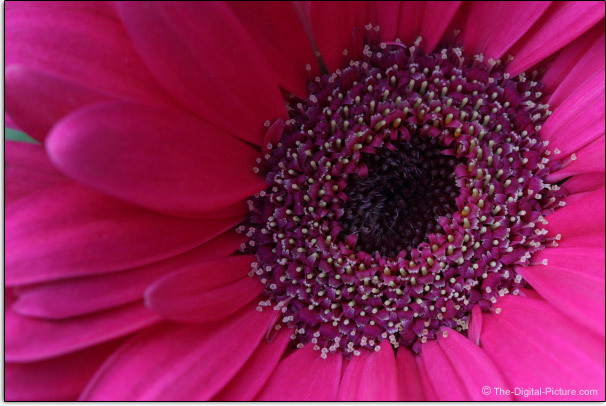 Spot metering uses about 3.8% of the viewfinder area at the center. The 1D IV's Evaluative metering algorithm has been improved for less metering dependence on the subject and more consistent metering control. Do you find AE (Auto Exposure) to be consistently under or over exposing your images? The new AE Microadjustment feature is for you. Dial in up to ±1 stop of adjustment in 1/8-stop increments. I prefer to use manual exposure settings when possible, but there are times when auto exposure is the better option - such as when shooting under changing light conditions. 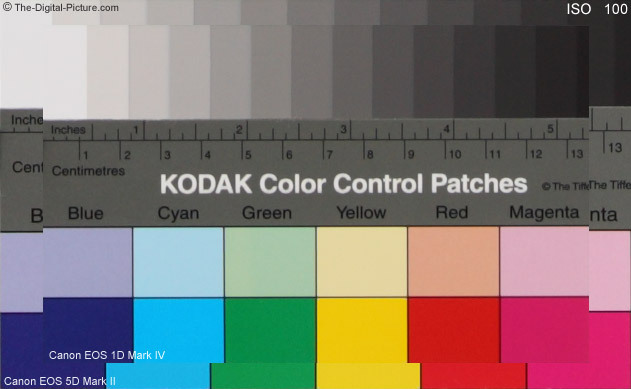 Of the exposure (image brightness) parameters able to be auto-determined by the camera, the ISO setting is the one that has long been underutilized by the camera's auto exposure functionality (this parameter required a film change in the old days). Auto ISO has been around for many DSLR iterations, but the full range of ISO settings were not available in all modes until the full Auto ISO feature I've wanted appeared in the EOS 7D: Auto ISO that uses the full normal range of ISO settings in most modes including M mode. And now this very useful feature is available in the 1D Mark IV. Auto ISO in Manual exposure mode creates what is essentially an Aperture AND Shutter Priority Mode. I can dial in the M mode fixed aperture and shutter speeds I want and let AE determine the ISO setting needed. I can set the fixed shutter speed I need and aperture I want to track sports players from shade to full sun, under changing skies and with a rising or setting sun without exposure setting worries. The camera simply adjusts the ISO settings to accommodate my settings. I love it. Note that no way is provided to set exposure compensation while M mode and Auto ISO - a shortcoming I would like to see Canon address. Like the 1D III, the 1D IV has a fast 1/300 max standard Flash Sync shutter speed for Canon Speedlite Flashes (plus High Speed Synch) and FEC (Flash Exposure Compensation) of up to ±3 stops is available in 1/3- or 1/2-stop increments. The 1D IV provides a flash menu for complete control of external 580EX II, 430EX II and 270EX Speedlites. Do you find FE (Flash Exposure) to be consistently under or over exposing your images? The new FE Microadjustment feature is for you. Dial in up to ±1 stop of adjustment in 1/8-stop increments. "The EOS-1D Mark IV's AF system has been comprehensively reconsidered from its design components (sensor, firmware and mechanism) to its manufacturing execution. The design objectives were improved stability, reliability, precision and function. These objectives have been achieved with a totally new AF system, featuring totally new AF hardware and incamera software." [Canon EOS-1D Mark IV White Paper] The white paper goes on to describe many of these changes in depth, but I'll mention some in this review. The 1D Mark IV uses the same 45 AF point layout as Mark III, but the 1D IV's new low-noise AF sensor has 45 user-selectable AF points. 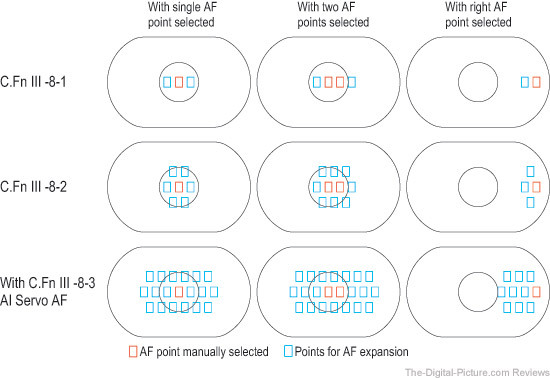 This is the same number of AF points available on the 1D II/N but significantly more than the 1D III's 19. I was not thrilled to lose my AF points when the 1D III arrived - I'm glad to have them back. Of course, if you prefer the 1D III way, Custom Function C.Fn III-10 will let you configure the camera for 19 AF points - or 11, or 9 inner or 9 outer. Cross-type AF sensors are sensitive to both horizontal and vertical lines of contrast and are twice as sensitive to vertical lines as horizontal lines. Meaning, they will often be able to obtain focus when a horizontal-only sensor may not. 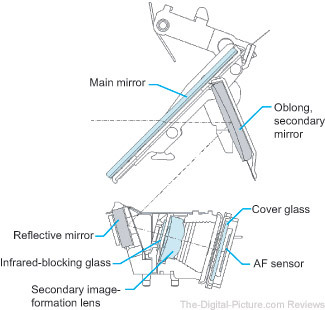 The center AF point functions as a high-precision cross-type sensor with lenses that have a maximum aperture of f/4 or wider. All focus points are horizontal-line-sensitive-only with variable aperture EF lenses (such as an f/3.5-5.6 lens). All 45 AF points (including the center AF point) remain horizontal-line-detection-functional with an f/5.6 lens. Currently, only Canon 1-Series bodies can autofocus with an f/8 max aperture lens (typically a lens + extender combination). Only the center AF point is functional at f/8. Like the 1D III, the 1D IV divides the tasks of calculating focus and driving the lens between two CPUs - a dedicated AF CPU and the camera CPU. Appropriate is that the 1D IV is using the latest-available DIGIC IV CPU with approximately six times more processing power than the DIGIC III. Completely revamped firmware is now used to calculate predictive focus. Additional new AF features include automatic point-of-focus compensation for spectral source variation, Spot AF and orientation-linked AF point selection. A typical focus point covers more area than shown by the AF point square in the viewfinder. Spot AF allows the actual AF point size to be reduced - to allow a more precise focus to be obtained (usable on super telephoto lenses only?). Orientation-linked AF point selection allows different AF points to be selected for horizontal and vertical camera orientations. As always, what matters is reality - how the design works in real life. And in real life use, the statement I am continually telling myself while reviewing my 1D Mark IV shots (especially those taken in AI Servo mode) is ... I'm impressed. Canon's DSLRs typically perform very well in One Shot AF mode. Like the 1D Mark III, the 1D IV One-Shot-focuses very fast and very accurately. I don't perceive any differences in AF lock timing between the two. Far more challenging to a DSLR is AI Servo AF with a subject rapidly approaching the camera at frame-filling distances. This scenario is exceptionally challenging - and this is a DSLR capability that separates the best from rest. When the Canon EOS-1D Mark III hit the streets, a great controversy surrounding its AI Servo performance erupted. Some encountered few problems, others experienced a significant number of OOF shots. Some (myself included) were pleased with the performance after updates were provided by Canon. The bottom line is that the Canon EOS-1D Mark IV is delivering a higher percentage of in-focus AI-Servo shots than any DSLR I've used to date. No, it is not perfect (I don't know if perfection can be achieved with a human behind the viewfinder), but, at 10fps, it delivers a VERY impressive number of sharp shots from a burst. For example, in the 21-shot sequence shown below in this review, only 2 or 3 shots are even slightly out of focus - and even these are very close. Very unusual is that nearly all 1D Mark IV AI-Servo AF misses I've seen have been front-focused - usual is for DSLRs to be trailing the action when they miss focus (As I'm writing this review, Canon has issued a firmware update that addresses the specific front-focusing issue I'm experiencing). According to Canon, the 1D IV can track a subject approaching at 31 mph (50 kph) up to about 26.2' (8m) away. Golden Retrievers can run at about 30 mph, making them a great 1D IV target. The fact that they bounce a lot when running definitely complicates AF tracking them. Of course, to properly test any camera function, the lens should not be the minimum factor (or the lens factor should be minimized) - one of the best lenses available must be used. So, Canon EF 300mm f/2.8 L IS USM Lens, meet Sierra the Golden Retriever. 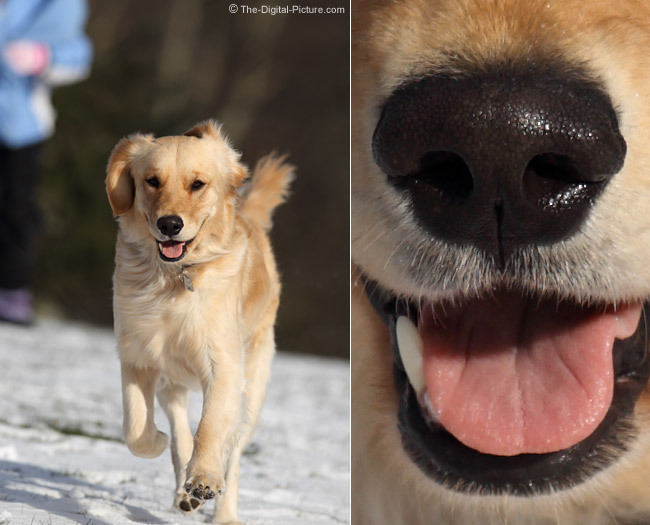 Dogs have great noses, but keeping their noses sharp in your photos is very challenging if they are running. In this case, the 1D IV's AF is "on-the-nose". The uncropped image (left) was shot at 1/2000 and f/4.5 using All-AF-Points-Active (in AI Servo mode of course). The RAW format image was processed in DPP using the Standard Picture Style. Even with a sharpness setting of only 2, some over-sharpening is visible in the hairs below the dog's nose (look for the jagged hairs). I have never had so many sharp-in-focus images from a session with a running dog before. Many of these shots were taken at or near the provided Canon speed/distance rating. This rating is indeed just one possible rating. For example, the 1D IV can track a fighter jet at longer distances and something far slower at very close distances. As I said, the burst that this example shot was taken from was using all AF points active. My results were similar when using the center AF point-only. Particularly impressive is that I was not able to keep the AF point perfectly pinned on my bouncing target nose at all times, but the camera maintained focus regardless. Canon claims that "stability" was one of their AI Servo AF goals - to keep the subject in focus even if the AF point was temporarily obstructed or moved off of the target. I'd say they achieved this goal. 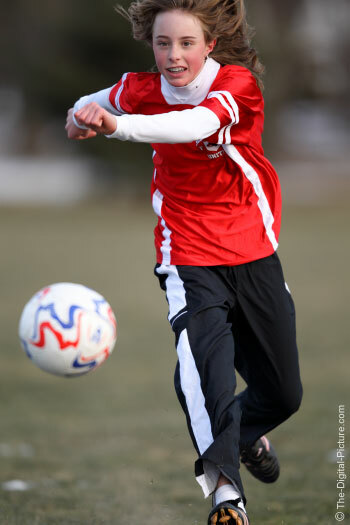 My soccer action photography results were similar. Under dim indoor arena soccer lighting and under cloudy skies outdoors, the 1D IV delivered a very high percentage of sharp images. I love shots of kids running (they always look excited when running with someone intently watching). At reasonably close distances, even young kids are challenging for an AF system to keep up with. The 1D IV performs remarkably well at this task. Like the EOS 7D, the EOS 1D IV utilizes " ... algorithms that automatically sense the use of a macro-focusing lens at close distances, appropriately adjusting AF operating parameters to better accommodate unpredictable camera/subject movement." [CWP] When shooting at macro distances handheld and/or with a moving subject, it is very hard to maintain the precise focus required by the shallow DOF available to work in. The 1D IV's macro-sensitive AI Servo AF and Canon EF 100mm f/2.8 L IS USM Macro Lens combination handles this situation very well - allowing me to concentrate on the exact desired framing. Canon calls it "AI Servo II". I'm impressed. This is easily the best AI Servo autofocusing camera I've used. Update 2/17/2010: Since writing the original review, I've had opportunity to shoot a couple of different AI Servo scenarios with the 1D IV. Downhill skiing was the most AF-stressing of these and while the center-only AF point continued to work well (though not as well as with soccer - and poor with a no-contrast solid-black-clothed subject), specific peripheral AF points delivered only fair performance - missing some shots I thought it should not have missed and missing some by more of a distance than I previously experienced. Update 4/07/2010: I shot a soccer game last night. The weather was hot, the sun was low in the sky and the uniforms were mostly solid white. Looking at the results, I wondered if I was using the same camera that I shot soccer with a couple of months ago. There were a higher percentage of OOF shots (that should not have been OOF) than I am used to seeing with this camera. The positive side was that I got some of the best sports shots I've ever taken. Update 6/06/2010: Many thousands of sports action shots later, I can say that the 1D IV indeed lets me down on occassion. I haven't been able to determine any consistent factors for the cause of OOF AI Servo shots, but heat and the color white were often involved (FWIW). And still, very frequently, the 1D IV delivers a very impressive focus hit rate - as I saw in my original testing. So I believe that Canon still has room for improvement in this regard. Combine impressive AF with an also-impressive 10 fps shutter and you have the potential for incredible shots. For the uninitiated, dealing with the volume of sharp images the 1D IV produces from a sports or similar event can be daunting and time consuming. Use the mouseover links bar below to review a 10 fps sequence of captures from the Mark IV. The uncropped images in the above burst sequence were shot with a Canon EOS-1D Mark IV and Canon EF 400mm f/2.8 L IS Lens. When shooting action at 10 fps, your job is to concentrate on keeping the AF point/framing properly aligned while tracking the subject. You get quick glimpses through the viewfinder as the mirror returns between shots. The fastest-available frame rate and shortest-available shutter lag give the 1D IV a very responsive feel. This is the ultimate-at-review time Canon DSLR for catching action. The 10 fps frame rate even sounds incredible - and listening to it forces a smile (unless you are in a war zone of course). The burst MP3 would make a great Ring Tone. While the 1D IV is responsive and very crisp sounding, as you can tell, it is not the quietest DSLR. Silent mode helps, but a 10fps burst is going to attract attention. Missing are the electronic curtain Live View quiet AF modes found on some other Canon DSLR models. The 1D IV's shutter is the same as in the 1D III - its durability rating is best available. Also best-available is the 1D IV's build quality - which is essentially the same as the 1D Mark III. The 1D IV and the other 1-Series bodies are as big and heavy as DSLRs get. If you are moving to a 1-Series body from one of the Rebel series cameras, you are going to be in for an adjustment. However, if you are using one of the mid-sized bodies (such as the Canon EOS 50D or the Canon EOS 5D II) with a Battery Grip or Wireless File Transmitter, the size and weight difference is not significant. The comparison images below will show this. The solid build and comfort of the vertical grip are significant advantages to the 1-Series bodies in my opinion. They may take some getting used to, but once you are used to them, you will never want to go back to anything else for serious shooting. Here is a visual comparison of various Canon DSLR Cameras. Use the mouse-click links below the image to see the respective camera. Obvious is that the 1D IV looks like the 1D Mark III and the 1Ds Mark III. Not so obvious in this comparison is that there are actually some slight changes on the Mark IV. Some of the buttons have been enhanced by one or a combination of greater protrusion, shorter stroke and/or enhanced detent. The delete key enjoys enhanced detent. The joystick has greater protrusion (though the difference is barely noticeable). The primarily changes I am noticing are the AE Lock and AF Point Selection buttons' greater protrusion and shorter stroke. For the most part, these are positive changes. The one exception I encountered is that, while shooting birds in landscape/horizontal orientation from a tripod, my hand was touching the vertical/portrait grip's AF-On button enough to activate AF and IS on the lens I was using. I have not encountered this problem before with any DSLR and couldn't see anything unusual in my setup this day, so I simply turned off the portrait grip functionality. I have not encountered this issue in any other situations through review date. Update 2/17/2010: I have now encountered the unintentional AF-On button press in a couple of additional situations. So, I'm not pleased with this feature change. I should mention a feature unique to the Canon 1-Series bodies and available via buttons on the camera back - the 30 second voice memo recording capability. This is an excellent way to remember information pertaining to a photo - including the names of the subjects. Other benefits from the tempered glass LCD cover include better scratch resistance and an anti-reflective, smudge-resistant coating. Less glare, enhanced clarity (especially in a bright environment) and better color ... All said, the 1D IV's LCD is a very nice upgrade from the 1D Mark III's LCD. 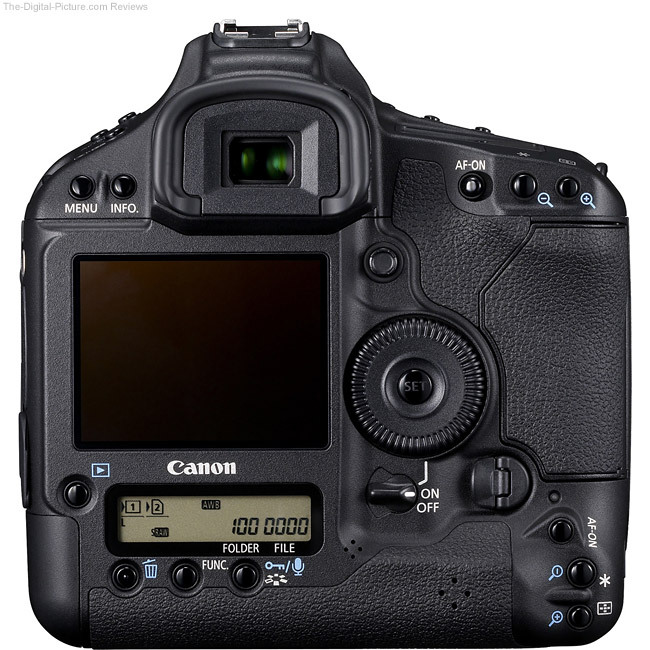 As expected, the 1D IV has the Live View feature found in all of the latest Canon EOS bodies. It's a great feature - I use Live View a lot for still life, product and landscape photography. What I don't use much are the still-slow but "... now faster compared to the EOS 50D and the EOS 5D Mark II ..." [Canon] contrast-based AF methods available in Live View. The new Face Detection AF Mode, however, facilitates those over-the-head/over-the-crowd shots needed frequently by photojournalists/sports/press photographers. Enter Live View Mode with Face Detection AF Mode selected (in the menu), hold the camera high, frame using Live View (the good viewing angle on the LCD permits this), hit the AF button (either the Shutter Release or the AF-On button), the camera detects the face and you take the shot. Nice. Here is a quick list of the 1D Mark IV's pertinent-to-video specs: MPEG-4 AVC video compression, variable (averaged) bit rate, Full HD 1920x1080 at 30p/25p/24p fps, HD/SD 1280x720/640x480 at 60p/50p fps (actual frame rates match the NTSC or PAL standards such as 29.97 for NTSC), .MOV file format and linear PCM audio recording. Full manual exposure control is available including ISO settings ranging from Auto (allows fixed aperture and shutter speeds), up to and including 102400. ISO 102400 allows shooting in near-fully-dark conditions, but the image quality will not impress you nearly as much as the capability - just because you can doesn't mean you should). Auto expsoure modes use center-weighted average metering. AF during video is available but not recommended - even by Canon (DSLRs are better suited for production-type video than home videos, but they certainly can be used for both). The nicely-positioned FEL button (see below) is used to start/stop video recording. The 1D IV includes a built-in, get-the-job-done monaural microphone and a 3.5mm jack for an external stereo microphone such as the Rode Stereo Video Mic. All compatible lenses can be used - and the 1D IV has reduced aperture drive noise when using them. Video memory card requirements are 8MB/second or faster for CompactFlash and Speed Class 6 or higher for SDHC. Recorded file size is limited to 4 GB per video clip and a single video cannot be longer than 29 minutes and 59. DSLR video is a great feature that is being used by more and more people/companies/businesses, but it is not for everyone. If high end production video is for you, this camera quickly becomes bargain-priced. There is no Mode dial on the 1-Series bodies. A button press and rear/top control dial change is used for all camera settings. The Canon EOS-1D Mark IV has a total of 5 modes available including Bulb. Also found on consumer and entry-level pro camera models but missing on the 1D IV are the Basic Zone pre-defined modes, the recently introduced "CA" (Creative Auto) setting and the fully-automatic point and shoot green square mode. With ISO set to Auto, the available "P" (Program) mode provides near-fully automatic functionality. One feature that sets the Canon 1-Series bodies apart from the rest of the EOS DSLRs is the large, bright viewfinder. First, notice how the viewfinder eyepiece extends back farther than the compared-to bodies above? The extra nose relief makes the camera more comfortable to shoot - and keeps nose prints off of the LCD. Second, the 1-Series viewfinders are all-glass pentaprisms with approximately 100% coverage (they are close, but not quite 100%). WYSIWYG - No guessing where the frame edges really are during composition. The 1D IV's viewfinder is the same as found on the 1D III - no improvement was needed in my opinion. If you have used the 1-Series cameras before, you will be right at home with the 1D Mark IV. If you have not used them, you will find the learning curve relatively short as the shooting parameters across the Canon EOS line are generally similar. The EOS-1D Mark IV has the same rugged build quality including a Magnesium-Alloy frame (as shown above) and the same dust/water resistance as the EOS-1D Mark III. This is as good as it gets. 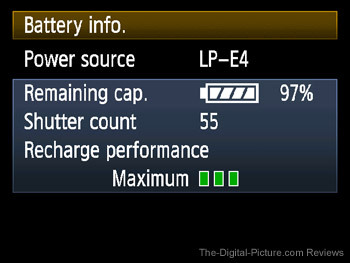 Like the 1D III and the 1Ds III, the 1D IV uses the Canon LP-E4 Battery Pack. Canon rates the LP-E4 + 1D IV combination at 1500 shots. While the battery is the same, the reduction in the 1D III's 2,200 shot rating even after new power minimization techniques is "... due to the much higher power consumption required by the increased image processing performance, for the increased pixel count, and faster memory card access speed." [Canon White Paper] The battery life rating for Live View shooting is approximately 270 shots (or about 3 hours) and the rating for video shooting is 2 hours and 40 min. Actual battery life is affected by many parameters including Live View and other rear LCD use (video), temperature, Image stabilization ... Using the Battery Menu option (shown above), you can check remaining battery capacity, shutter count and recharge performance (in 3 levels). The first full charge on my new 1D IV battery yielded 1771 pics with 27% capacity remaining. Up to two LP-E4 batteries charge sequentially in the provided, corded charger. Many of Canon's DSLRs have a Wireless File Transmitter available for them. But these days, WFTs can do far more than what their name implies. The WFT-E2 II Wireless File Transmitter allows the 1D IV to be completely remote controlled (focus, remote Live View, shutter release) from a computer and allows control of up to 10 slave cameras (1D IV, 5D II and 7d models) over a protected Wi-Fi/802.11a wireless network. And more. Obviously not everyone needs these capabilities, but the capabilities are there if you do need them. The 1D IV can be controlled by a directly-attached computer without the WFT. A required Canon EOS-1D Mark IV option is a lens. 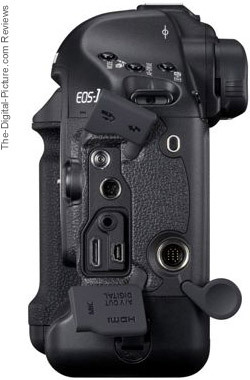 There are no 1D IV w/lens kits available as I write this - and I doubt we will see one. The 1D IV is not a starter camera for most people and therefore, most people buying a 1D IV already have one or more lenses. The two general purpose lenses I, at review time, recommend most highly for this camera are the Canon EF 24-105mm f/4 L IS USM Lens and the Canon EF 24-70mm f/2.8 L USM Lens. If you need to stop action in low light, get the 24-70. When you buy a Canon DSLR, you are buying into an incredible family of lenses and other accessories. One of these lenses is just the start. I should mention here that the support provided by Canon's USA division is excellent (I have no experience with the other Canon divisions). When I call for support, I get an intelligent person who sincerely wants to help me with whatever my question or problem is. Repair service, though I have seldom needed it, is fast and reliable. This review does not cover nearly all aspects and features available on the camera. Some of the features I have omitted include in-camera: High ISO Noise Reduction, Long Exposure Noise Reduction, Highlight Tone Priority, Auto Lighting Optimizer, Peripheral Illumination Correction ... Canon has written two books that are available for free download (see the links below the review). I highly recommend the 123 page White Paper that outlines new features found in the 1D IV and the owner's manual is always recommended reading - this one is 276 pages long (same page count as the 7D owner's manual, interestingly). 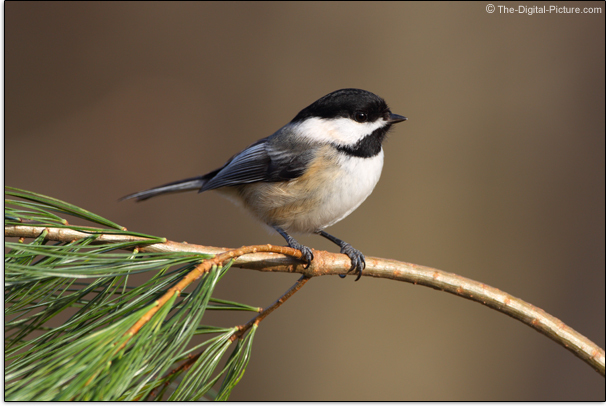 The Chickadee above was captured by the Canon EOS-1D Mark IV and Canon EF 500mm f/4 L IS USM Lens with settings of 1/250, f/8 and Standard Picture Style. While sports action photographers and photojournalists photographers come to my mind first as the primary uses for this camera, the fact is that the 1D IV performs very well in all categories and makes a great camera for nearly every use. Wildlife is usually in action. Wildlife photographers will find the relatively high density sensor, sharp images, fast frame rate, great AF and field-ready build qualities exactly what they are looking for. Wedding photographer's careers depend on capturing the moments - all of them and with perfection. That is what the 1D IV does well. While I expect a significant portion of 1D IV owners to be professional photographers, I can tell you without a doubt that not all 1D IV will be so. Many will be parents with other careers who value capturing never-going-back-to moments in their kid's lives more than for-pay photographs. Inspecting only the exterior of the 1D Mark IV with the LCD turned off, one would be hard pressed to call it an upgrade from the 1D III - they are practically identical. And this is a good thing as the 1D III is a great camera body. But, start using the LCD and start looking at the image results the 1D IV captures - especially from fast action, and there is no doubt that this is a very nice upgrade. I expect that most established professionals currently using a 1D III are going to make this upgrade. The upgrade from any of Canon's APS-C/1.6x bodies to the Canon EOS-1D Mark IV is a big one - and of course, the cost to trade up is reflected in this. Those not needing the fast performance, impressive AI Servo AF and rugged, sealed build of the 1D Mark IV may find the Canon EOS 5D Mark II to be a better option - especially better from a cost perspective. The 5D II's image quality is at least as good as the 1D IV's (with higher resolution) and the full frame sensor is a big feature for me personally. The Canon EOS-1Ds Mark III is a closer match to the 1D IV in terms of AF, rugged build, faster shutter release and viewfinder, but it is missing some key features including video and a 10fps burst rate. It is, of course, full frame. The Canon 1-Series bodies have always been top-of-the-line and the specs for this new model were excellent, so I wasn't concerned about too much going into this review. I did have two concerns though. The first was image sharpness - this concern was dispelled early in testing. The second concern was the new AF system. I have given this attribute scrutiny and at this point, as I mentioned, I am very pleased with the 1D IV's AF performance. This is the body I plan to use throughout the Spring sports seasons. And I'll probably use it for a significant amount of other purposes in the meantime. Nice camera, Canon. My 1D IV was purchased new/retail. And as I write this review, the Canon EOS-1D Mark IV remains impossible to get. And as good as the camera is, I suspect it will remain so for many months into the future. If you want a 1D IV, my suggestion is to get inline - preorder now.